Saint Petersburg is now a capital, true, already cultural. Here each street is a landmark, each house is an architectural memo. It was in this city that A. Pushkin lived and wrote, N. Gogol created his works, shared his discoveries with Mendeleev, Lomonosov and other famous figures with the whole world. You’ve probably heard that Peter is often called the city of bridges, and it’s not accidental: today there are 580 bridges here. They are laid through 68 waterways that permeate the city through. This is a real Venice with its water taxi, a lot of islands and amazing beauty around. 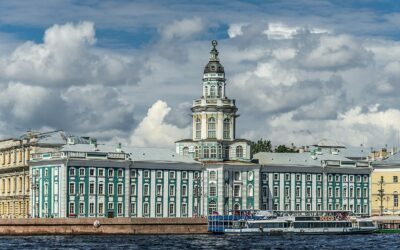 The organizers of the World Cup – 2018 estimated that most of all tourists will come to St. Petersburg, Moscow and Kazan are also leaders. In total, there will be 7 matches in the city – four group matches, one-eighth finals, 1/2 finals and a 3-place game. The city authorities have prepared 1690 special volunteers who have completed many trainings from FIFA, and will help tourists free to navigate the city, suggest information about past and upcoming matches. All football matches will be held at the stadium “St. Petersburg”, which was opened in 2017. Its capacity is 56196 people, for the media there are 400 more places. The total area occupies 287,600 square meters, including the park. 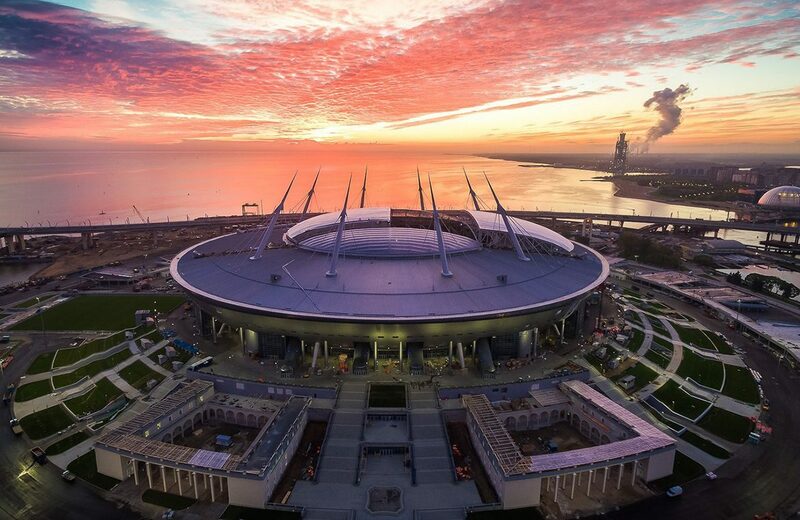 The main feature is a sliding roof, it is built to protect spectators and players from the changeable St. Petersburg climate, especially in winter. Its diameter is 286 meters, this design is closed in just 15 minutes. Another know-how – a retractable field weighing 8,400 tons and an area of 9,840 squares. It is made to protect the lawn from damage, and from time to time it simply extends, leaving a concrete foundation. You can get to the arena in several ways. Specially for the World Cup 2018, a new metro station, Novokrestovskaya, was opened. 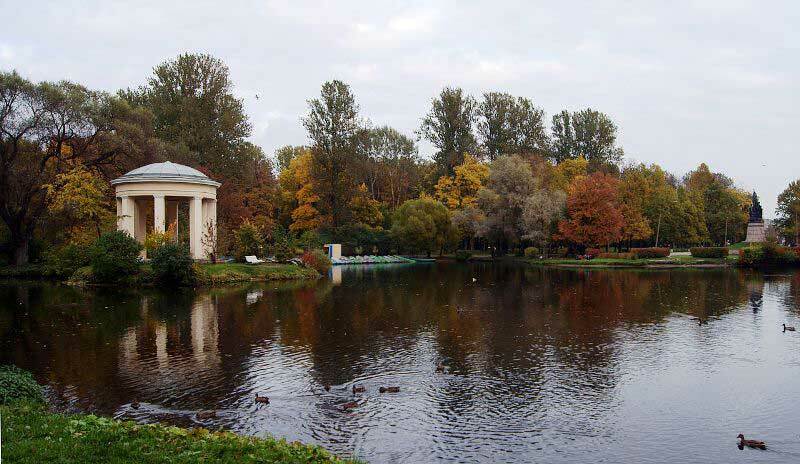 It is 15 minutes walk from the main stadium of St. Petersburg. 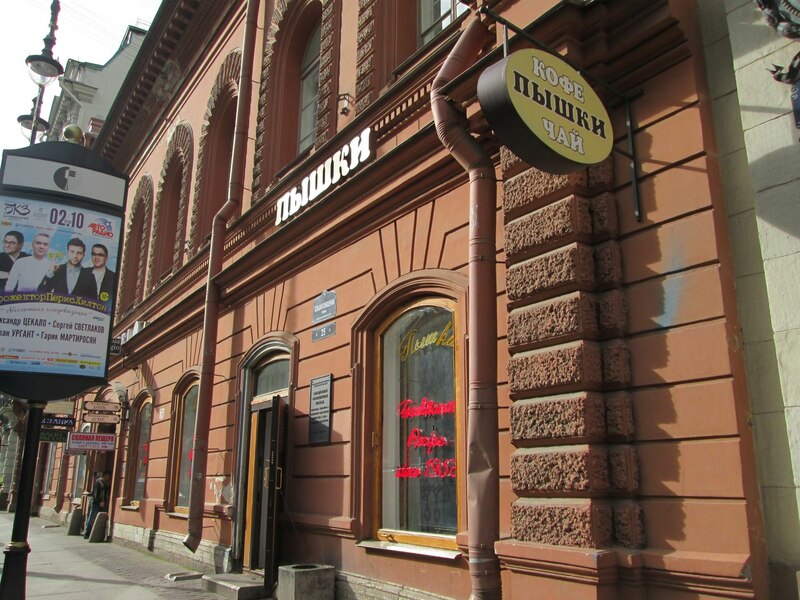 Also within walking distance are the stations “Staraya Derevnya” and “Chkalovka”. In addition, during the matches will run free-of-charge buses with routes S3, S4, S6, to plant fans near the above-mentioned metro stations. To reach the match is possible and independently through the pedestrian Yacht Bridge. The path from the beginning of the bridge to the stadium will be one and a half kilometers. If you have a private car, you can purchase a special pass to the parking lot of the stadium, and then the pedestrian road to the match will take you no more than 5 minutes. Parking spaces are about 2500, so if you could not get permission to travel, you can get to the Yacht Bridge and leave the car in the nearest private parking lot, which is around 10 in the district. The administration of the stadium draws attention to the fact that the process of passing the inspection takes 25-40 minutes, depending on the queue. You can not bring weapons, alcohol, pyrotechnic products, bottles and fragile glass objects, products in tetra-packs, Nazi attributes and other things that can interfere with the game. 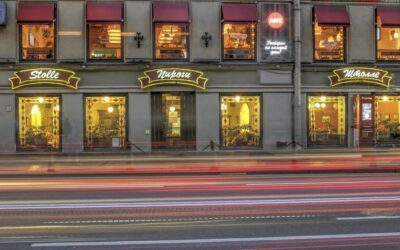 In St. Petersburg there are about 700 hotels and hostels with more than 30,000 beds. 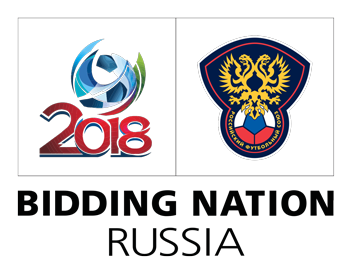 In addition to the World Cup 2018 was equipped with approximately 1,000 economy class rooms. Organizers predict the congestion of hotels at 100%. the entire staff of the hotel must have two languages, and at the reception accept cards of all payment systems. Last year two more new hotels were opened for the World Championship. 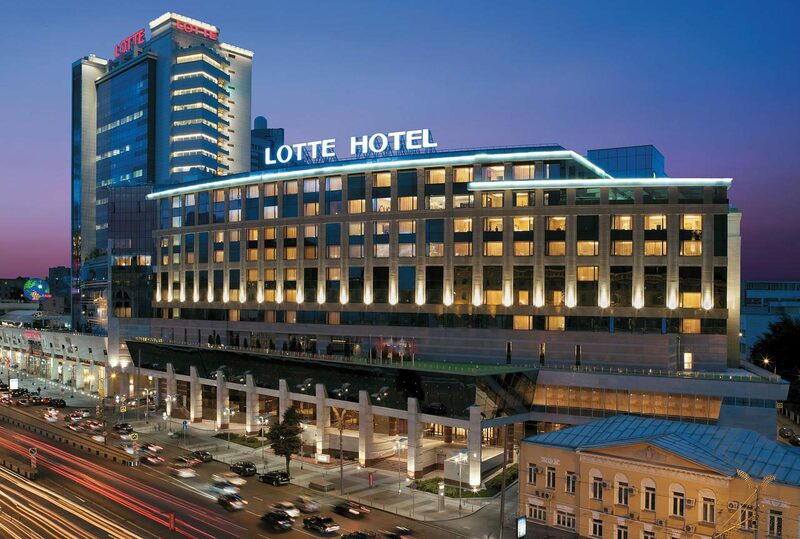 One five-star – Lotte Hotel St. Petersburg. 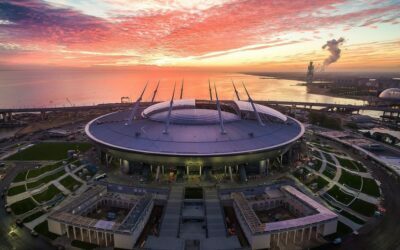 Three nights during the World Cup will cost the tourist more than 190,000 rubles. It is located right in the historic center of the city, it has its own spa, sauna, fitness room and premium restaurant. 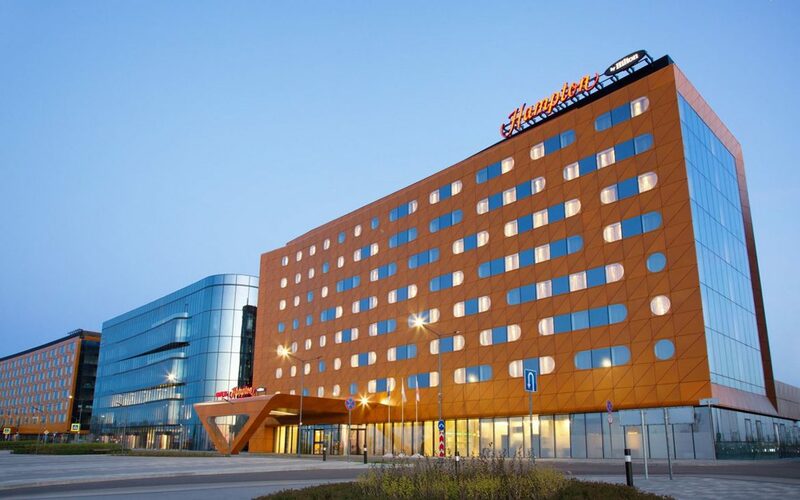 The second hotel “Hilton St. Petersburg ExpoForum” is a bit cheaper. 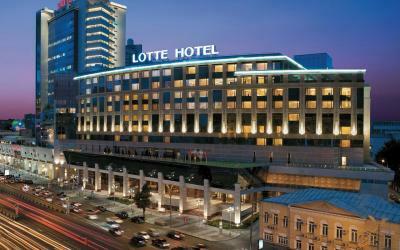 It has 4 stars, but also has a fitness and spa center with a swimming pool, a luxury restaurant. The only negative – the hotel is located 20 km from the center. 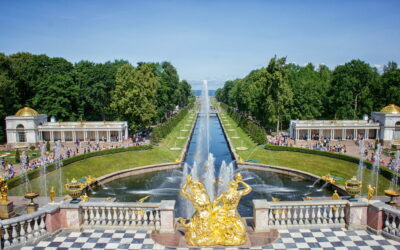 Double accommodation for 3 nights will cost 42,000 rubles. For those who want to travel cheap, there is an option to reserve a bed in the hostel. However, prices for the 2018 World Cup are already overestimated, and there are practically no places left. 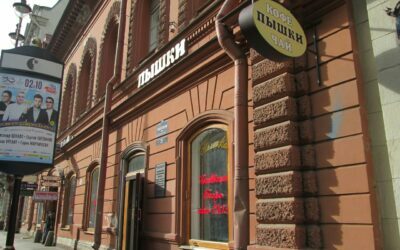 On average, spending the night near the city center will cost from 3000 to 5000 rubles per person. If you went with a large company, consider the option of renting private apartments. The cost depends on the repair and remoteness. On the sites of realtors offer housing from 10,000 rubles, but not always the photo of the object is true, so do not forget to clarify these points from the landlord. Just want to note that the article describes not all the sights of the city, they are here at every step. To FM-2018 specially trained guides will help tourists and tell useful information. 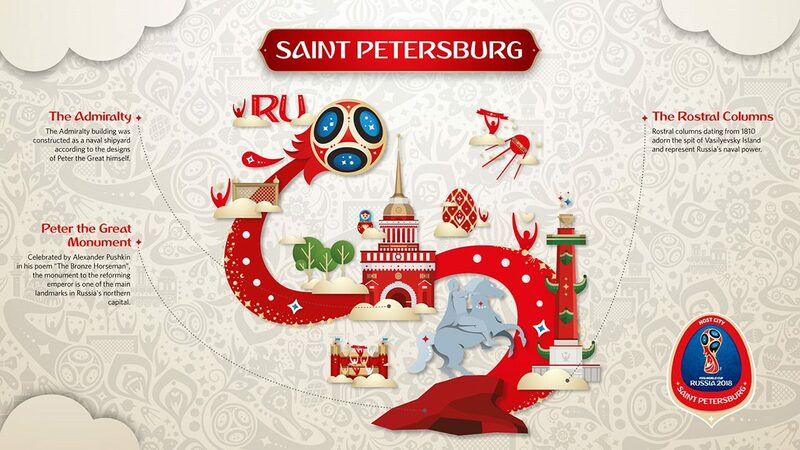 Even if you do not get to St. Petersburg during the competition, be sure to come just to get acquainted with the city. Hermitage. This is one of the largest art museums in the world, which must be visited. The collection began to be collected by Catherine II and since then it has more than three million expositions. The works of Raphael, Titian, Rembrandt, Rubens, Tiepolo, Kampen, Caravaggio, Van Dyck, Poussin and other great masters are kept here. Also here is the famous canvas “Madonna and Child” by Leonardo da Vinci. 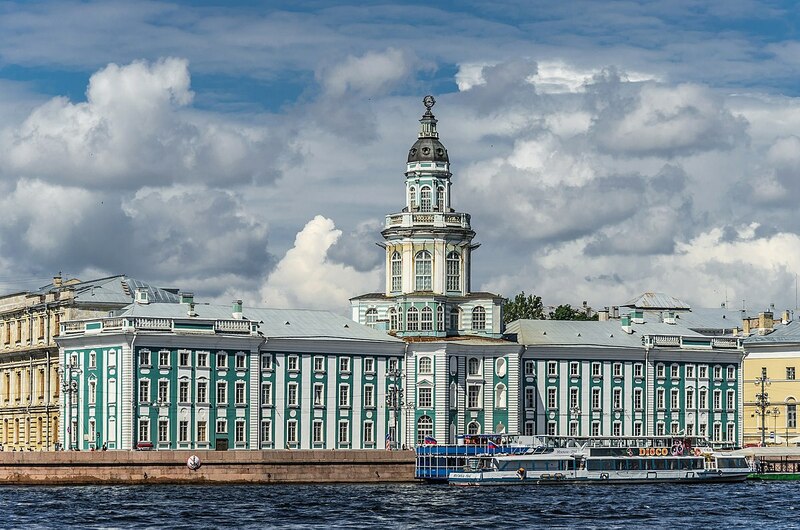 Now the Hermitage is located in nine buildings on the Dvortsovaya Embankment. Their appearance and internal wealth are another reason to visit this place. Here they created generations of architects, among them Bryullov, Rossi, Rastrelli and others. You can purchase a comprehensive ticket that will operate all day, and provide the right to enter all buildings. Its price is 700 rubles, and for children, students and pensioners, admission is free. 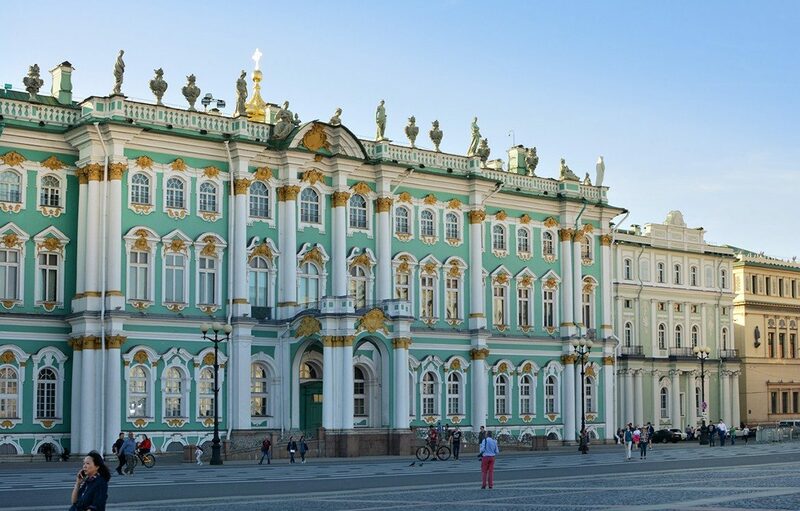 If you plan to visit one or several buildings, it will be cheaper – 300-400 rubles. But every first Thursday of the month the entrance is generally free, so anyone can come. Admiralty. An important monument of architecture and an amazing building. 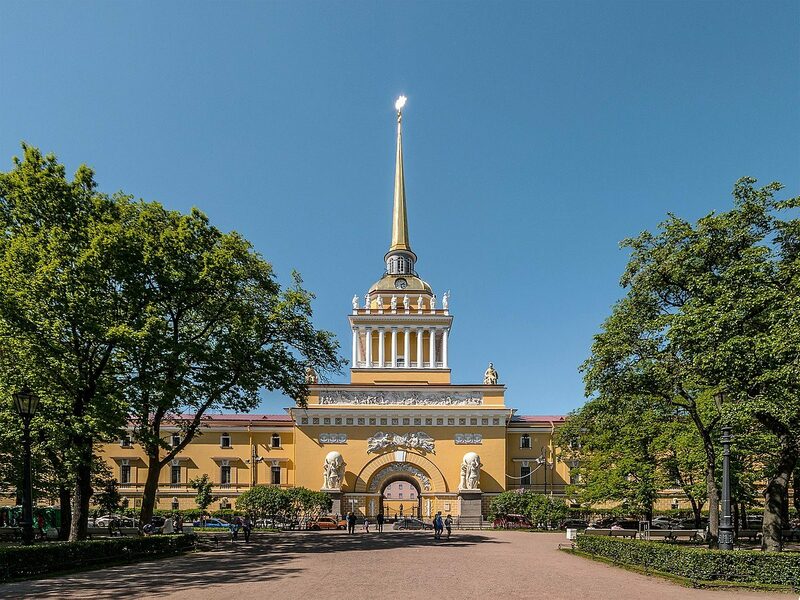 It was from this building that the history of the Russian fleet began. The construction was originally built as a shipyard and, according to the idea, should reflect the power and strength of the country. Its perimeter is 1200 m, and the central facade is 406 m long. In the center there is a tower with a spire on which a gilded ship is located. He is one of the main symbols of St. Petersburg. According to historians, the figure repeats the silhouette of the first ship, which entered the city immediately after its foundation. It is he who gives rise to the three main streets of the city – Gorokhovaya, Nevsky and Voznesensky Prospekt. Summer garden. 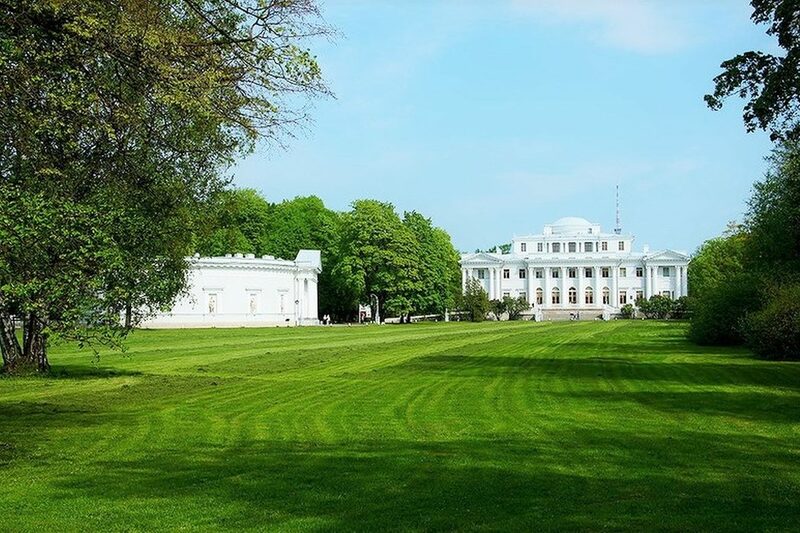 He was built in 1704 by order of Peter I as a residence at the royal summer palace. 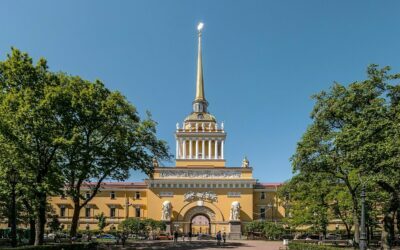 He believed that a rich winter palace was needed to show its superiority to foreign guests, and for the soul, he equipped himself with another place where he lived every summer until his death. 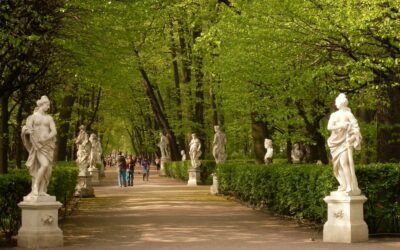 In addition to flat avenues, trimmed trees and unusual fountains, the park contains about 90 busts of famous historical figures, which the king himself brought. Walking paths, pay attention to the columns, which smoothly flow into gilded roses. They were dedicated to the writers of all generations, among them A. Akhmatova. 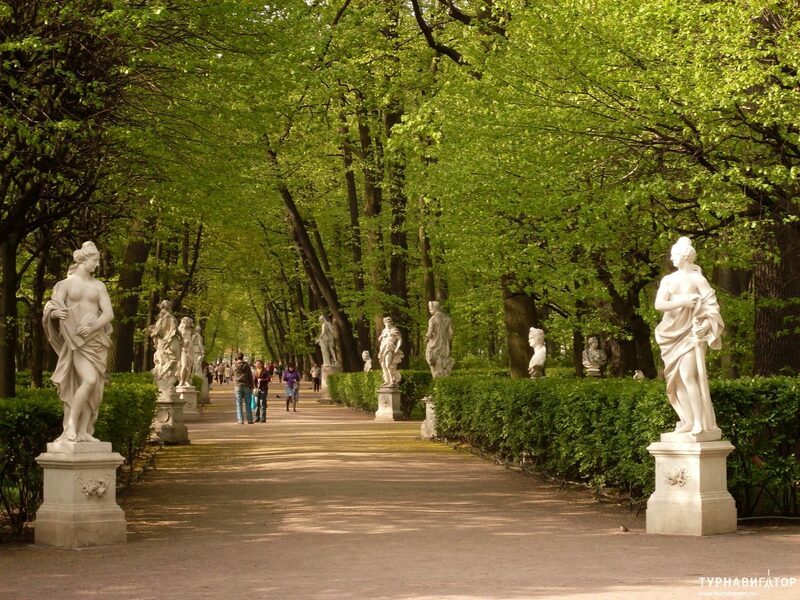 The garden itself is rightly called a museum of art in the open air. Entrance to the garden is free, before the visit seasoned tourists advise to install on the phone application with a free guide on it. There, in an accessible form on the map, all key objects with a description are indicated. If you did not, you can use free Wi-Fi in the Tea or Coffeehouse or follow the information posters for visitors. The Cabinet of Curiosities. One of the most famous museums of anthropology in the world and the oldest in the city. It was founded in 1714 by Peter I and collected there anatomical rarities for the purpose of studying and developing medicine. Initially, there were collected live exhibits – people who lived at the museum and who were simply exposed to show to others. For example, the story speaks of a 126-cm-tall man, he had two fingers on his hands and they looked like claws. To attract visitors, the entrance was free, and each person who came in was poured coffee or a glass of vodka. Now the museum has about a million exhibits and is the most complete collection in the world. In total there are 8 sections: one of them – anatomical anomalies, the rest – halls that reveal the tradition and culture of the peoples of the world. 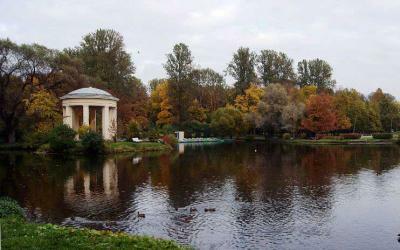 The cost of an adult ticket is 300 rubles, students, cadets, students and pensioners can visit the Kunstkamera for 100 rubles. If you come on the third Thursday of the month – the entrance will be free. Cruiser “Aurora”. 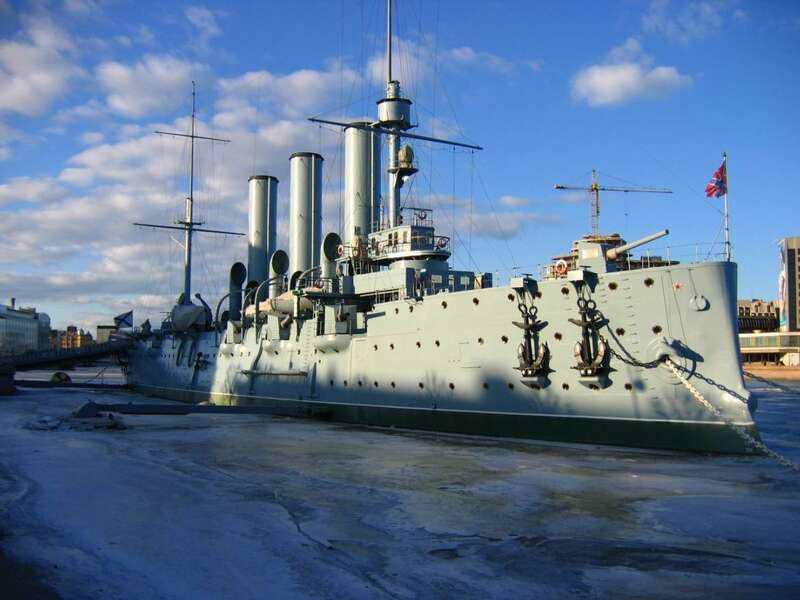 The legendary cruiser, which served as the beginning of the October Revolution, after it signaled the storming of the Winter Palace. He took an active part in the Great Patriotic War, but because of the constant bombings he got injured and ran aground. 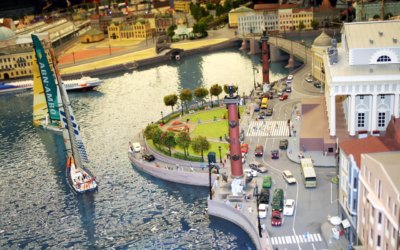 It was rebuilt in 1944 and put on “eternal parking” at the pier near the Petrograd embankment. For today it is a museum with six halls and 450 exhibits. It works every day, except Mondays and Tuesdays. Adult admission ticket for Russian citizens costs 400 rubles, for foreigners – 600 rubles. Museum-apartment of Alexander Pushkin. There is no person in the world who does not know this legendary Russian writer. This place was the last house of his and his family before his death. The poet filmed 11 rooms in the mansion of the princes of Volkonsk. Pushkin brought here after the duel with Dantes, soon he died in his private office. Now the poet’s admirers have the opportunity to see how he lived. 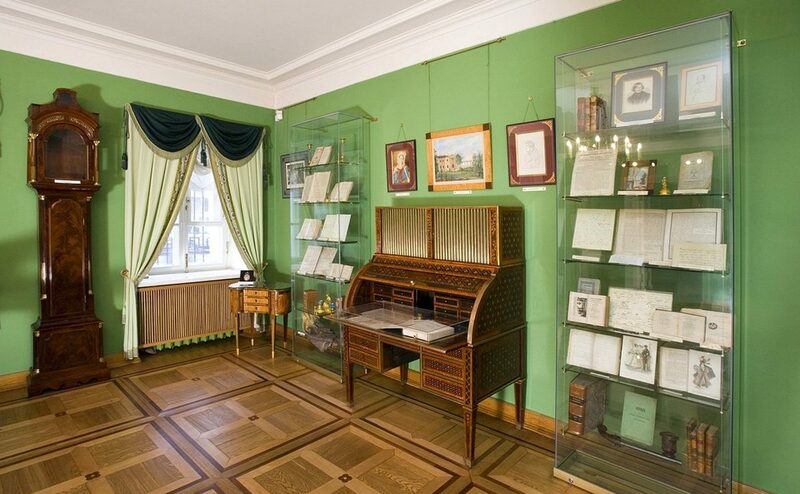 Until now, his desk and chair have been preserved, as well as the sofa on which Pushkin died. Even in the apartment is stored a lock of hair of the writer and his posthumous mask. In addition to these exhibits, those who wish can see the personal belongings of his family – his wife and children. Citizens of Russia can enter the apartment for 80 rubles, for foreign tourists the price is higher – 200 rubles. Please note that you are allowed to take photos in the museum, you need to buy a separate permit. Grand Model Russia. If you came to Russia for only a few days, but want to see as much as possible – be sure to visit this place. 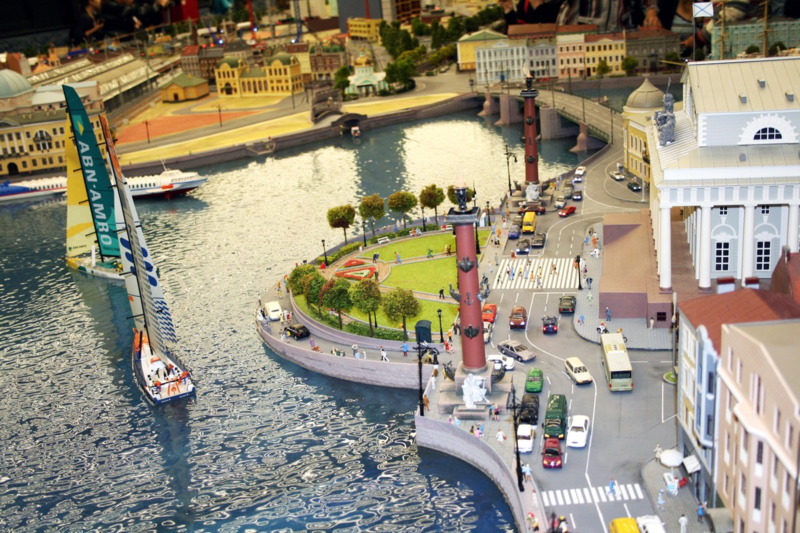 It is a model of the entire country, which is located on a field of 800 square meters. 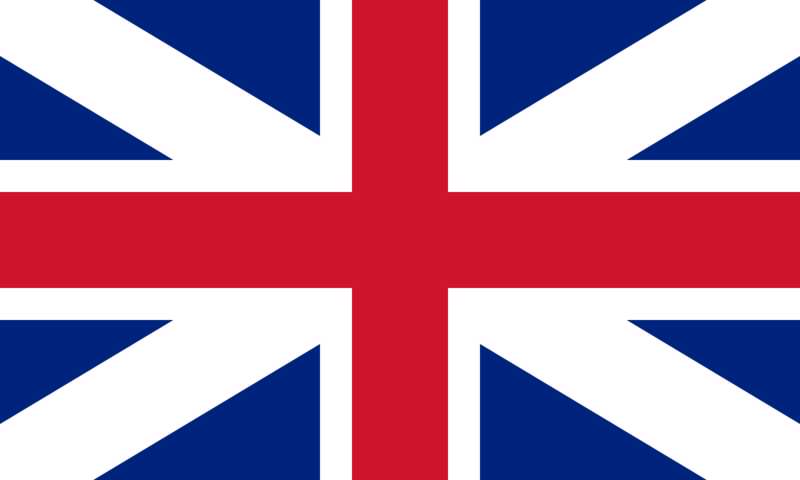 Here all regions and their features are recreated, life is shown, which our country lives: work, study, entertainment, rest. 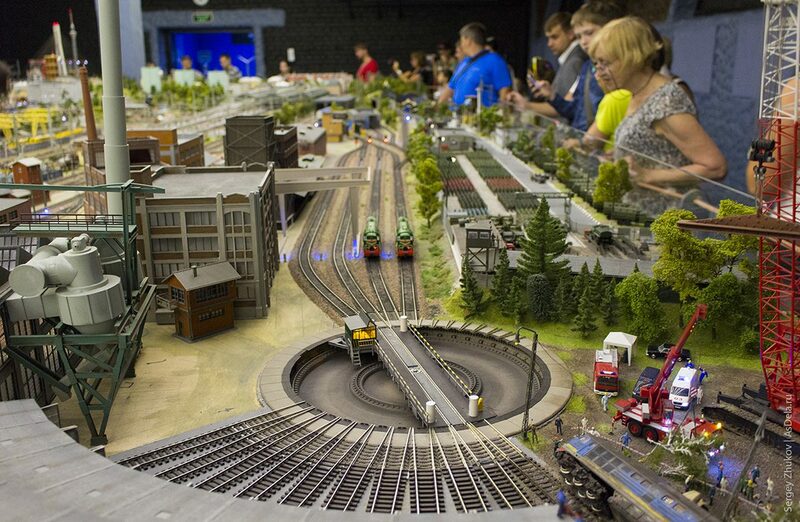 On the layout everything moves and everything is interactive. In addition, you can drive different objects, thanks to special buttons. Also, there is a change of day and night, every 13 minutes 500,000 LEDs change their color. Many technologies are applied for the first time in the world, the layout has already received awards and recognition from world experts, and it continues to improve further. Smelt fish. This type of fish is found in the creeks of the city. It was thanks to her that the locals managed to survive the blockade. Since then, the smelt has a special attitude. She even installed a monument and arranged annual festivals, when the smell of fish cooked on the grill was found all over the city. It can be enjoyed in any local restaurant, for a portion of 250 gr. asking for 250 rubles. Pyschki and fishnet pancakes. Local adviseers must definitely taste “Pyshechnaya”, go to “Pirogovy Dom” or “Stoll”. 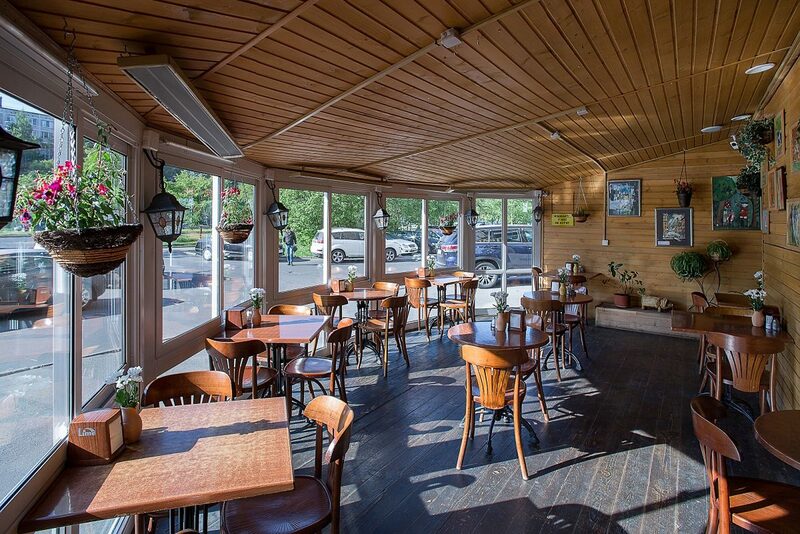 The most important feature of these establishments is the traditional taste and inexpensive price. The best snack in St. Petersburg are pies and pies in local stalls. They are sold here with a variety of fillings for every taste. The price for one piece is only 25 rubles. 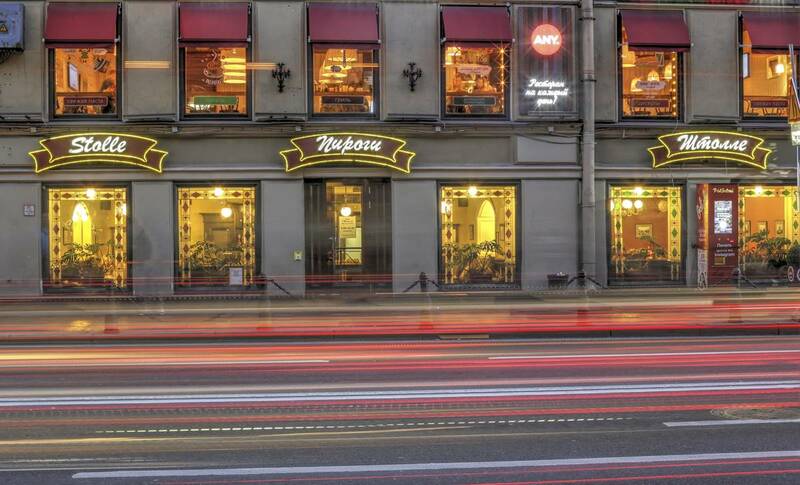 Visit the St. Petersburg canteen. They are inexpensive and can be well nakushatsya. The average dinner goes somewhere around 200-250 rubles, but you pay not only for tasty food, but for an indescribable atmosphere.